Emery's side suffered a major blow in their bid to make next season's Champions League when they slumped to a lacklustre 1-0 defeat at Everton on Sunday. The Gunners slipped to fifth in the table as a result of their latest dismal away performance, putting their hopes of finishing in the top four in jeopardy. But Arsenal can also book a place in the competition if they win the Europa League, and Emery is determined to ensure his players do not slip up again when Napoli visit the Emirates Stadium for the first leg of the last-eight tie. "We need to be consistent in the next matches and if we do that we can win," Emery said after the Everton defeat. "There's some frustration collectively with the result, but we won't change our idea and our work." While Arsenal have struggled on their travels, they have been formidable back home in north London. 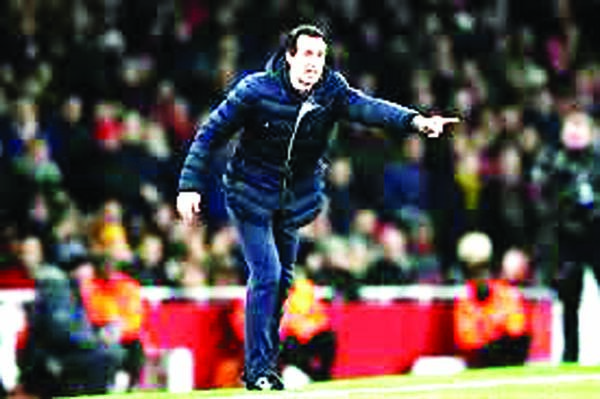 Emery's men have won their past seven games at the Emirates in all competitions, including second-leg comeback victories against BATE Borisov and Rennes in the Europa League. The Spaniard hopes Laurent Koscielny and Granit Xhaka shake off injuries in time to feature, while Aaron Ramsey and Pierre-Emerick Aubameyang could return after starting on the bench at Everton. "When you lose one match, maybe you can look at the players who didn't play, but I think it's rarely the consequence," Emery added. "We've won matches with other players, other systems, and we need to be efficient in each moment." Like Arsenal, Napoli go into the tie in an agitated state after a worrying run. The Serie A side have not kept a clean sheet in any competition since beating Red Bull Salzburg in the Europa League on March 7 and lost to struggling Empoli before a disappointing draw with Genoa on Sunday. Ancelotti warned his players they must improve to avoid more misery at the Emirates. "We're defending badly at the moment. It's an alarm bell, certainly, because if we play like this in London, then we're in trouble," he said. "It is unusual to see Napoli doing that, so we have four days to focus back on the basics, because these are basics we're getting wrong." Napoli will be boosted by the availability of forward Lorenzo Insigne, who has scored 13 goals this season, after he played 23 minutes against Genoa. Chelsea head to Slavia Prague for their quarter-final first leg in good spirits after Eden Hazard inspired a vital Premier League win over West Ham on Monday.